• Cause – type I, congenital; type II, pars interarticularis defect; type III, degenerative; type IV, traumatic; type V, pathologic; type VI, surgical. • Degree of displacement – grade 1, 0% to 25%; grade 2, 26% to 50%; grade 3, 51% to 75%; grade 4, 76% to 100%. Depending on the degree of anterior translation, instability and presence of other pain generators, patients may range from being asymptomatic to having radiculopathy. 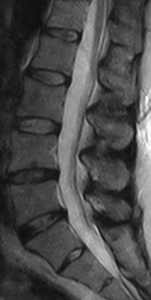 A spondylolisthesis is considered of little consequence if the slip is no greater than grade 2 and is stable. Once at grade 3 and beyond, radicular involvement is likely. 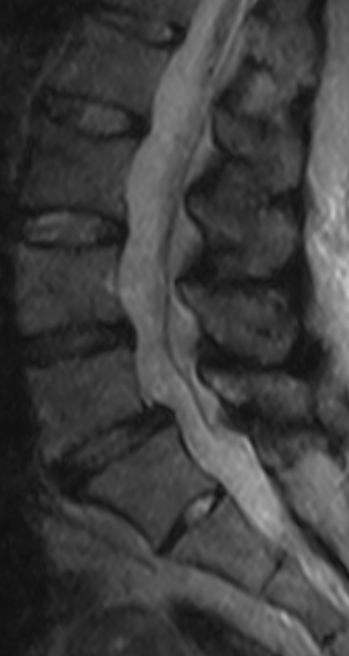 To gauge the degree and presence of any listhesis instability, weight-bearing imaging is required. Standing functional lumbar spine X-ray studies can readily highlight slippage grade and presence of instability. Recumbent/standing comparison MRI is another useful option in spondylolisthesis diagnosis, which has an advantage over standing X-ray in being able to image other potential soft tissue pain generators during the one MRI study. The value of recumbent/standing comparison MRI is highlighted in the following interesting case study: Ms S, a 49 year old worker in child care was referred by her health care practitioner for a supine/standing comparison MRI in relation to chronic lower back pain with radiation into both thighs, left more than right. Of note, her symptoms were worst when lying supine. Supine X-ray report findings of 2 years prior were reported as normal, apart from some small osteophytes at several levels. 1. L2/L3 diffuse disc bulge causing minimal right foramen stenosis. On the upright sequence, the disc bulge increases resulting in mild right and minimal left foramen stenosis. 2. L3/L4 small broad based posterior disc bulge causing mild right and minimal left foramen stenosis. On the upright sequence, the disc bulge increases resulting in increase in the bilateral foramen stenosis, more pronounced on the right. 3. L4/L5 small broad based posterior disc bulge causing mild to moderate right and moderate left foramen stenosis, on the supine sequences. On the upright sequences, there is Grade I anterolisthesis of L4 over L5. This finding was not present on the supine sequences. There is moderate right and significant left foramen stenosis, with irritation of exiting right L4 and compression of the exiting left L4 nerves seen. The right facet osteophytes contact the descending right L5 nerve. The increase in size of the disc bulge and the anterolisthesis causes mild canal stenosis. While supine and standing x-ray would have highlighted the anterolisthesis change, only with a supine/standing MRI comparison could the other findings have been shown. 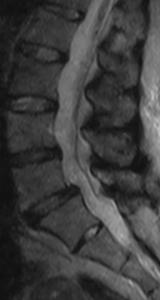 This entry was posted in Uncategorized and tagged diagnosis of lumbar spine injury on December 14, 2015 by admin.